The days are flying by- and getting 'shorter' at least that's what we think when we don't have as much daylight to accomplish our outdoor projects! We are hard at work on some of the 'last minute' details to make the Barn Sale a special place on Nov 6th & 7th. 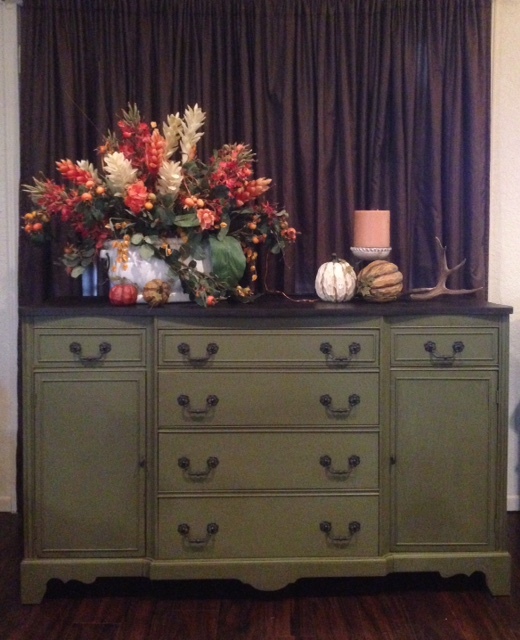 This first photo has us ready for Thanksgiving- a beautiful buffet painted a soft green with a dark top- this could easily fit into so many homes--- but alas.... only one quick shopper will make it home with this lovely piece! 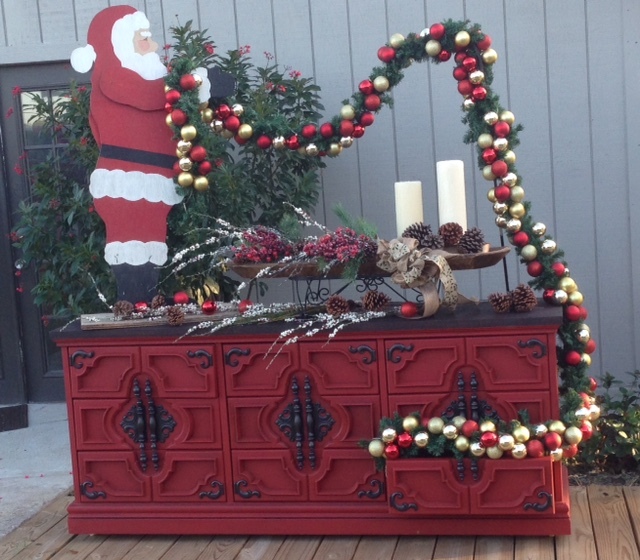 And this next beauty.... Oh My Goodness- If you don't know me let me just tell you that I really, Really like the color red..... this dresser/sideboard is absolutely gorgeous! I've seen the before photo and am only giving you the completed product! 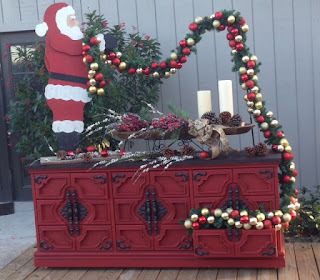 Both of these pieces will be in the Rustic Ranch Hands booth- it will be a big one that you won't want to miss! These gals have been hard at work finding just the right pieces of furniture to repaint in order to catch your eye! 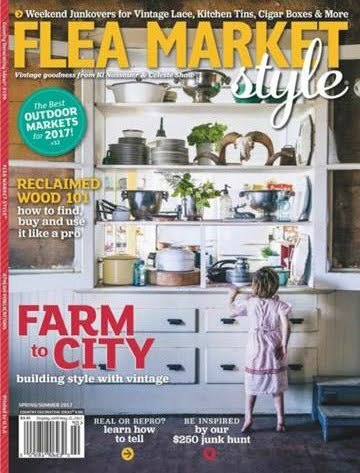 Vintage Trunk will be joining us for their 4th year- and we are absolutely delighted that they have chosen the Barn Sale to be part of their schedule! 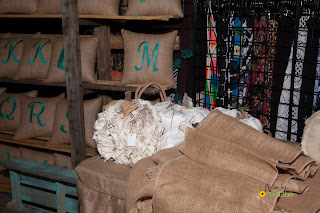 They have a fabulous selection of pillows- great for your personal decor, wedding gifts- they have Mr & Mrs Pillows...., graduation, Christmas- a place to find an all around great gift! 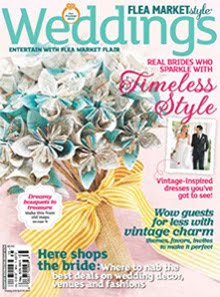 There will also be table runners- wonderful for upcoming Thanksgiving, Christmas and New Year decor and celebrations. 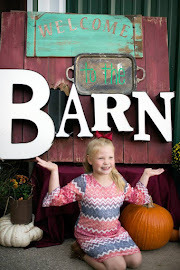 Burlap wreaths and fabric pumpkins were part of last years booth- along with adorable kids shirts and some bottoms too! 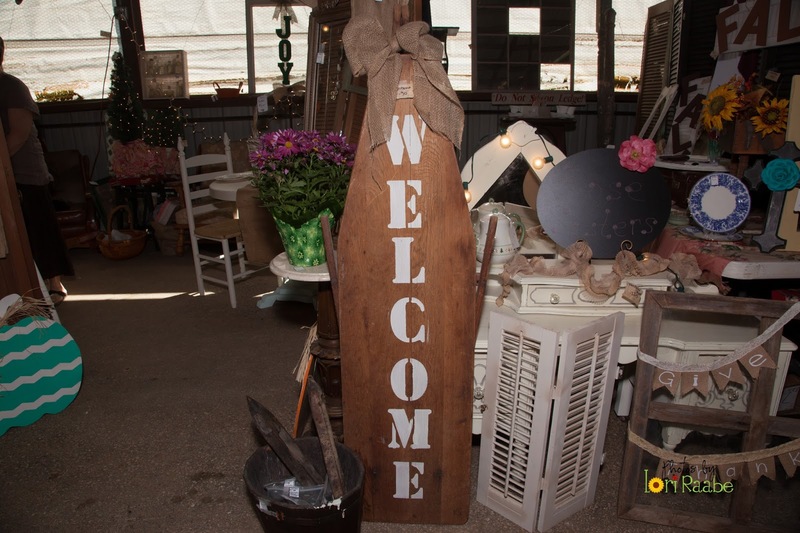 Be sure to stop in Vintage Trunk and welcome them back to the Barn! 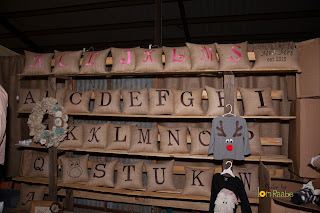 TM Creations has been with us in the barn the past 2 years as a part of Rose Sisters... They all decided that there was more than enough creativity for one booth that they had to get 2 booths this year- they will be right next to each other so it will still feel like family! TM Creations will be bringing these highly useful height markers- they can travel with you wherever you may move! In addition she will have embroidery work, vinyl work , signs along with vintage and some antiques! We are excited to have her back! Here are two of them from last year- Terra on the right will have the TM as mentioned above, and Tina is part of Rose Sisters joining us for her 3rd year! Their booth is always so well put together and has so many pretty and unique things! We are truly happy to have these sweet smiles back with us! They were really ready to Welcome you to their booth last year and we know they are excited to Welcome you back again this year! Please do not think I'm repeating myself when I say this- but every year we get applications from people that have been shoppers in the Barn and then fall in love with the sale and the other vendors and the shoppers and just want to be part of it all.... Case in point here for a new vendor from down the road that really impressed us with her photos- we had a hard time narrowing it down to these three.... I just hope I can make it to her booth before the masses start- hehehe.... that has yet to happen- I am the one darting around at 3:35 on Saturday trying to hit all the booths- impossible! Another reason why it's so hard to see all these awesome photos ahead of time--- tempting!!! This booth is called Made with Love- very appropriate. 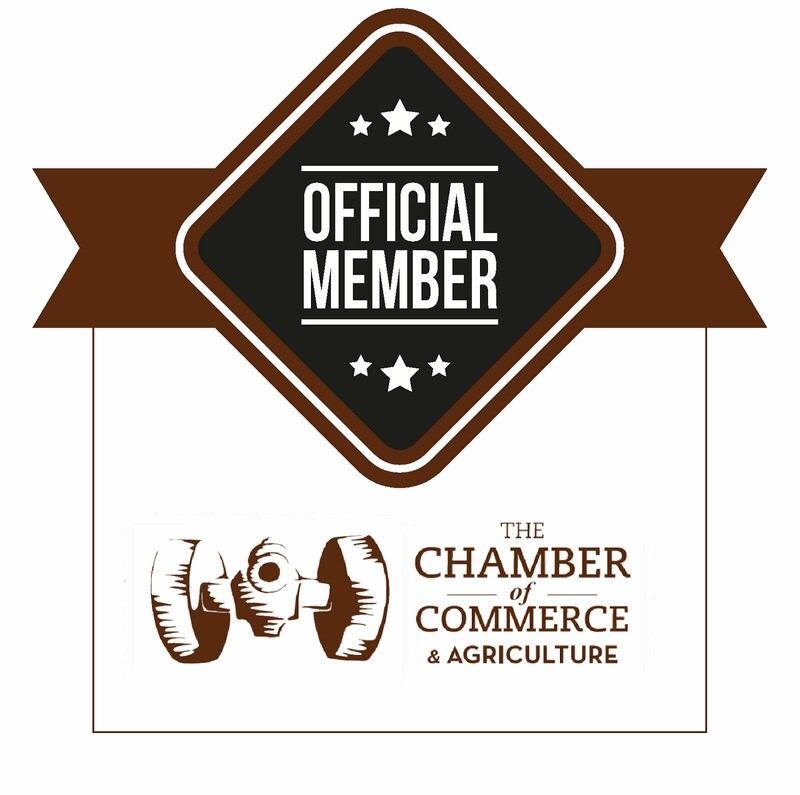 We hope you make them welcome as a vendor! 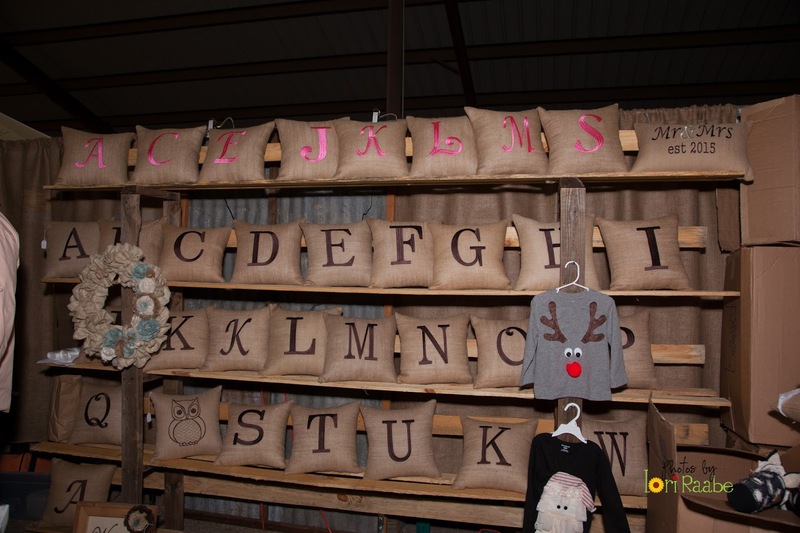 Dillo Designs will be coming down from Bastrop again- this will be her 4th year in the barn with us! 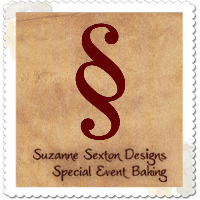 She enjoys using interesting beads, sterling and leather- great combinations to make beautiful wrap bracelets and a few other specialty pieces of jewelry. And lastly for this round- we bring you Burlap Babes! This mother daughter duo is not just Burlap- by any means! These ladies combine all sorts of found objects into cute decor- and if it needs painted they can do that too! 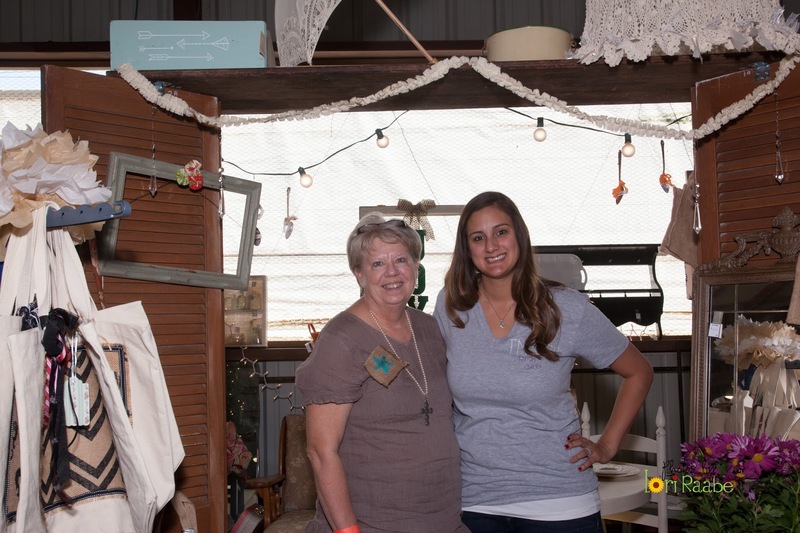 This duo was also on the list of previous shoppers turned vendors! This will be their second year in the barn- but again- they are not new to this market! They have a B-I-G space at Junktoria in Victoria along with participating at several shows during the year. We welcome them back to the barn! Have a Fabulous Weekend!!! WE cannot wait till the weekend of Nov 6th and 7th at JB Wells park in Gonzales, Texas.